When I first started working with stone back in my late teens, I quickly developed a passion for it. All of a sudden I started noticing stonework a lot more, every time I would see a stone wall or an old castle I would stop and take a moment to examine how it was built and image the work that went into building it. 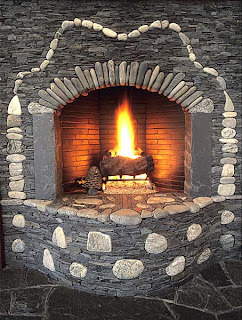 As a mason you definitely do appreciate quality stonework at a different level, as you have a pretty good idea at the amount of work that went into it. You also have a great respect for masters of the craft, who motivate and inspire you on a continues bases. One such master of the craft is Lew French. I have to admit I only discovered Lew’s work quite recently (you got to love the internet) but was immediately taken by it, and ordered a copy of his book ‘Stone by Design’ straight away. Lew has been working with stone for a little over 30 years now, producing exceptionally crafted, one of a kind pieces of work, from all things in the landscape to the most amazing interiors and fireplaces. Lew was born in the small farming town of Zumbrota, Minnesota. He started to work with stone when he was just nineteen years old. 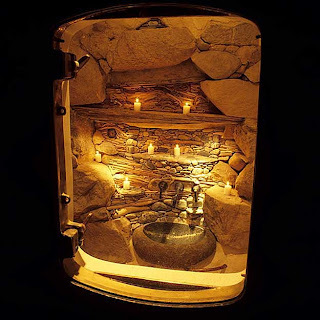 He moved to Martha's Vineyard over 25 years ago and has worked on his own stone designs exclusively since. Lew rarely uses mortar, he believes that every stone has its natural place and fit, and that altering or modifying stone takes away from its natural beauty, this respect and treatment of the stone, is what makes his work stand out, and gives it a real natural and aged look. Lew's dry stacking technique, is similar to the one used to build the old walls. 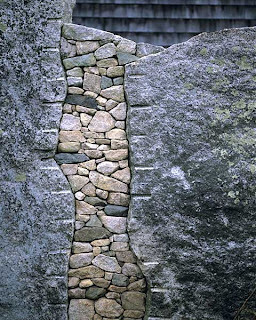 In a dry-stacked wall, the stones are laid one on top of each other without mortar, held in place by gravity. However, French's walls and dry-stacked mosaics have none of the gaps or disjointed pieces found in old stone walls. His stones fit tightly together, each fitting seamlessly into the ones around it. 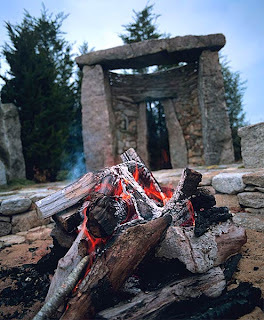 The stones Lew uses are usually not shaped or altered in any way. As he builds a wall, he searches for just the right stone to fit in his designs, a process that can take months. He finds or buys stones and stores them in a field. 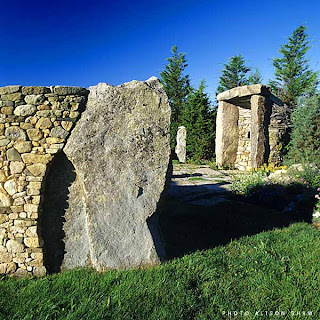 Some of the stones have been waiting in the field for twenty years, in order to fit into a perfect pattern. One of the reasons way I am such a fan of Lew and his work, is that I share much of the same respect and views of stone as him, and I can only hope that some day someone will want to pay me, what they are paying him to create a magnificent work of stone art, like these of this stone master that is Lew French. Below is a video featured on Lew French from CBS News from 2007. 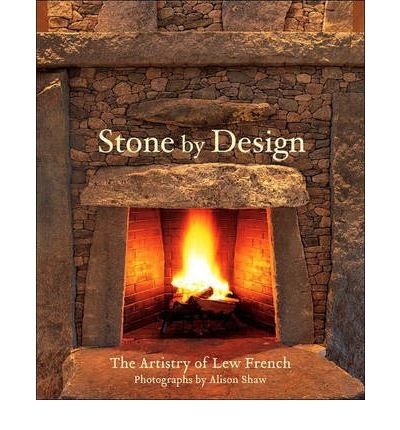 His wonderful book titled 'Stone by Design' that has more than 125 gorgeous photographs that showcase the beauty of his award-winning work in eight different homes, illustrating how rounded fieldstone, gray slate, rough granite, and even curvy driftwood can be incorporated into stunning pieces of functional art. French provides charming narration for each project: how an idea came to be; how a stone-splitting technique is executed; even how one of his most difficult pieces, a three-year-long project, was saved from ruin the day it was completed. 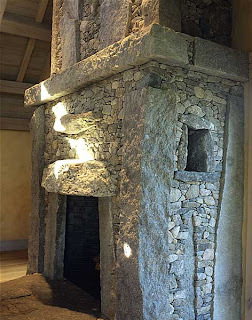 With its contemporary hearths of rustic slate, sculptured walls of both great granite slabs as well as stacked and rounded fieldstones, "Stone By Design: The Artistry of Lew French" will inspire design lovers to incorporate this material in home interiors and exteriors, whether as an artful writer's studio, a playful fireplace, or a carefully crafted garden pathway. More than just a stunning tribute to the work of Lew French and his unique vision and craft, this book celebrates both the function and form of stone. 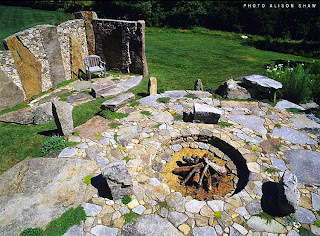 It's the perfect inspiration for anyone interested in adding the beauty of stone to their home or landscape . 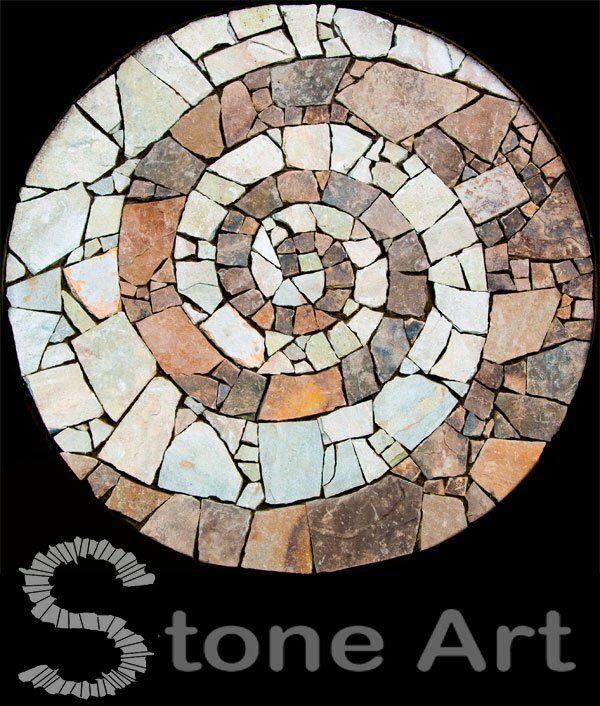 Click here to buy this great addition to your stone library with free worldwide shipping. The internet - my world! Oh, how beautiful! Real art! Beautiful stone work, I can see why you admire him. Each of his pieces, albeit new construction, have a remarkable aged aesthetic quality. Stunning. Sunny- Thanks for the comment you sent on the large mosaic project we are working on here in Tarpon Springs FL. Your blog is fab and inspiring. Living here in Florida great stones are a hard to come by. We must settle for coral rock or spend big bucks on imported rock. On a trip to Panama's Pearl Islands a couple of years ago, my artist fellow friends and I filled the empty spaces in our luggage with rocks. Rock on Sunny! 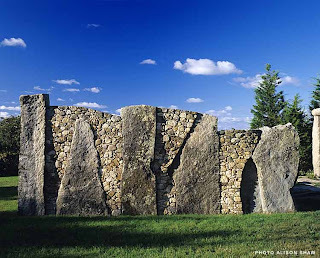 I saw a few of his stone walls a year or so ago (on television) and was awestruck. I always love seeing how something so utilitarian can become beautiful in the hands of the right person. 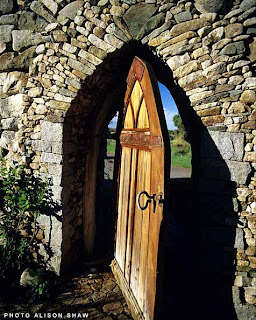 What amazing stonework! To be honest, I am quite speechless, which doesn't happen often. What a great artisan to be motivated by in your work with stone. Super gorgeous..I love that door! Everything is wickedly beautiful!! Awesome post! How cool. 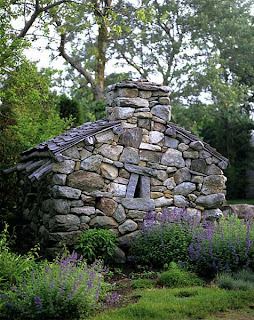 I love the little stone house- it looks enchanted! What a great blog! 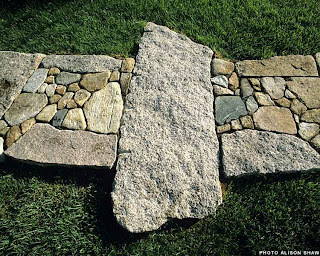 It is amazing how stone can enhance the garden and make a pretty garden beautiful! Great post. These are so beautiful. I can see what an inspiration his work would be. Magic! Stunning stonework!! 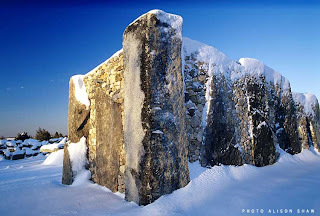 Stone Art! Inspirational!! Like you, I am also inspired by his fabulous work. Because I make mosaics myself, I respect the way he fits rocks together but I also love the way he creates such great compositions. What an awe inspiring Man! The thought that those stones are rarely mortared and are all placed to fit 'just so' really amazes me. It is the sort of beauty that just stops me in my tracks! I've seen the book before, but never the video, quite good. Some beautiful stonework. Thanks for sharing this, Sunny. Mr. French is a genius. I have never seen stone fit together is this way, with no shaping and so clean. A true marvel. You had me at: every time I would see a stone wall or an old castle.... The only castle around these parts is made of plywood and stucco and houses a miniature golf course. No stones or stone structures to be seen. Boy, am I missing out! We are from the semi desert Namibia and my husband is geologist so stones were a part of our lives and garden. 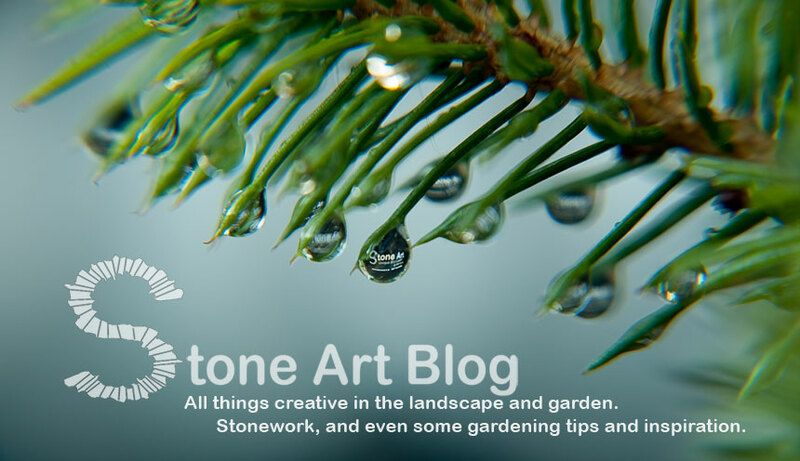 However what was done with stones on this blog is fantastic. To be able to see works like this is an honor - I agree with all praising the www. Amazing stone work! The design is very unique and the skill is great! We also take care not to show the mortar from front and try to show the thickness of natural stone and the shadow of the joint when we make a stone wall. Thank you for the comment on my blog. As a lover of stone, I am amazed by French's craftsmanship. These are truly works of art which will last for centuries. Thanks for introducing me to this incredible stone mason. Wonderful post. Amazing stonework! Thanks for linking to this again.